I read this book because it was amongst the interesting-sounding novels discussed in A Short History of Fantasy — of course, in certain respects this sounds more like science fiction, set as it is in the extremely distant future. Nonetheless, the feel of the novel is that of fantasy, with a certain amount of low-tech material culture. As the title of the quadrilogy says, this is the the Book of the New Sun. Some of the fantastic elements derive from the transplantation of extraterrestrial species on Urth in the generations of human space travel. Other things are possibly due to evolution. The inorganic elements of fantasy are a similar combination — extraterrestrial artefacts and creations of the deep history of human tech. But none of this is why I heartily recommend this book. All if it is, however, partly why this is not your run-of-the-mill piece of SF. Nevertheless, the unfolding of Severian’s narrative from the Citadel and beyond is itself compelling. Once it gets going, the plot hooks you and pulls you along with it; the world of Urth and its dying sun is revealed and unfolded before you as you learn more about the main character and the various other people with whom he interacts in the Citadel and city of Nessus. This entry was posted in Books, Literature, Science Fiction and Fantasy and tagged book reviews, gene wolfe, science fiction, the book of the new sun, the shadow of the torturer on November 26, 2016 by MJH. Jesuits in space! That alone would be enough for me to want to read this (how is it that this is the second/third SF novel I’ve read this academic year that features Jesuits?). The Sparrow is the tale of what happens when SETI finally pays off, and a Jesuit with his non-Jes friends birth this idea, which is funded by the Society of Jesus, to go and make first contact with an alien species whose radio broadcasts from Alpha Centauri they had encountered. Their goal is not evangelism like the Jesuits of old. Indeed, amongst the crew of this interstellar expedition are in-the-open agnostics besides a quietly agnostic Jesuit. However, like the Jesuits of old, their purpose is to engage on this expedition ad maiorem gloriam Dei — that very reason for which the Jesuits exist to this day. They are explorers — a linguist, an engineer, an astrophysicist, a botanist, a musician, a doctor, and so forth. To the greater glory of God, they set out to find what wonders his creation holds in store for them on a planet they learn to call Rakhat. This is not, then, what some fear — a novel that’s out to convert the reader to Catholicism or something. Russell tells the story from both ends, which I think pays off very well, sort of like the obsessive foreshadowing of Homeric poems and mediaeval romances. This is certainly a novel about faith. And psychological horror. About doubt. And the destruction of faith. And about wonder and glory and love (human and divine) and pain and sorrow. It is about finding faith and then being put through the wringer. I read the ePUB version, and there some problems with the Latin, with ablatives coming out where there should have been nominatives. Not sure if the fault was the software, the publisher, or Russell, but the first two seem more likely, given the people the author thanks in the acknowledgements at the end. This entry was posted in Books, Christianity, Literature, Science Fiction and Fantasy and tagged ad maiorem gloriam dei, agnosticism, book reviews, faith, goodreads, jesuits, latin, mary doria russell, science fiction on March 2, 2016 by MJH. As my Goodreads progress updates from this book were imported into Facebook, a number of friends were requesting my impressions, to know what I think about Hyperion. So here we go. I started Hyperion because it was one of those books that always featured in my Science Fiction Book Club leaflets when I was a teenager. I finished it because it is an elegant book with narratological layers and a compelling story. Hyperion is the story of seven travellers—pilgrims—chosen to make the ‘last Shrike pilgrimage’ on the planet Hyperion (hence the title). As they make their journey, interstellar and then across Hyperion, each of them tells his or her story. This is not merely passing the time but seeking answers as to why they had been chosen by the Shrike Church to go on this pilgrimage. The end result of the pilgrimage is a place called the Time Tombs, where time itself is distorted, and where they will encounter a four-armed, metallic being called the Shrike, around whose cult the Shrike Church and Shrike pilgrimages arose. Most of the book is taken up with the travellers’ tales. Simmons writes each tale in its own style—the ethnographer, the soldier, the mad/drunken poet, the academic, the private investigator, the diplomat. And as the stories unfold, so does the imagined universe of Hyperion and the story of the planet Hyperion. I like the narratological techniques, that the story is comprehensible at the beginning, but persevering throughout changes your understanding of earlier references either through deepening or shifting. I have no doubt my opinion was solicited not only because this is a great piece of fiction (let alone science fiction), but also because of the various perspectives on religion represented. In this post-earth future, Christianity is almost dead (although we get the all-American favourite, a Roman Catholic priest, to represent the faith), and, as I say, cult has arisen surrounding the being called the Shrike, although not necessarily to worship it as a God, so much as to venerate it as God’s weapon of destruction. Other religions are mentioned throughout; one character is an agnostic Jew who has encounters in dreams and such that seem to be with the divine. Other characters also have dream encounters, or what seem to be dream encounters, with other intelligences. The book presents a lot to think about concerning belief and the fate of religion in a post-earth universe. The other area of philosophical inquiry that unfolds slowly throughout the book is that of artificial intelligence and human interaction therewith. How far beyond us could AI go? Could it? How can humanity guide its future? What would the results be of super-powerful AIs that are beyond human control? This is a great book, and now I need to read the sequel since I have no idea how any of it ends! This entry was posted in Books, Christianity, Literature, Science Fiction and Fantasy and tagged artifical intelligence, book reviews, chaucer, hyperion, pilgrimage, religion, science fiction on October 23, 2015 by MJH. This book was okay — it’s a collection of five stories from early in Pern’s history. The first is a short story, the others all long enough to be ‘novelettes’ (I guess). I enjoyed the fourth and fifth stories the best — the fourth is about dragonriders and the earliest Weyrs (and the dragons with their riders are the best thing about Pern), and the fifth an interesting tale about one of the bands of survivors from the first time Thread fell on Pern. Unfortunately, none of the stories that aren’t from F’lar and Lessa’s time in the history of Pern grab me nearly as much as those originals, so this was a bit hard to stay with at times. But now I’ve read it, and The Skies of Pern will mean I’ll have read all of the original, pre-Todd Pern novels. FYI, if you’ve never read a Pern novel before you must read Dragonflight first!!! This entry was posted in Books, Literature, Science Fiction and Fantasy and tagged anne mccaffrey, book reviews, dragonriders of pern, first fall, pern, science fiction, the chronicles of pern on March 9, 2015 by MJH. The quotation in the title of this post is a line from Capt Jean-Luc Picard (Patrick Stewart) to Guinan (Whoopi Goldberg) in Star Trek: The Next Generation, Season 5, Episode 23, ‘I, Borg.’ The Enterprise has on board a Borg drone rescued from a crash site on a planet. Dr Crusher is determined to treat the Borg well and not use him for (allegedly) ‘genocidal’ purposes. * Geordie La Forge is helping install some new hardware in the Borg, and possibly some new software as well — a virus to potentially disable the entire Borg Collective. In one scene, Picard and Guinan are fencing and have a fraught conversation about why the Borg is even on the ship in the first place. Both Picard and Guinan have very personal, very bad histories with the Borg Collective. Guinan’s home planet and civilisation were assimilated/destroyed by the Borg. Her people now roam the galaxy as people without a home. The Borg showed no mercy. Why, Guinan asks, should Picard? Picard, on the other hand, was assimilated in the Season 3 finale and then led the Borg in an assault against the Federation with Earth as the target in the Season 4 premiere (‘The Best of Both Worlds, Parts 1 & 2’). He was designated Locutus of Borg and was used by the Borg as a liaison between the Collective and the United Federation of Planets. Because of Picard’s knowledge of Starfleet, when the Borg engaged the fleet at the Battle of Wolf 359. 39 out of 40 Federation starships were destroyed by the Borg with 11,000 casualties. 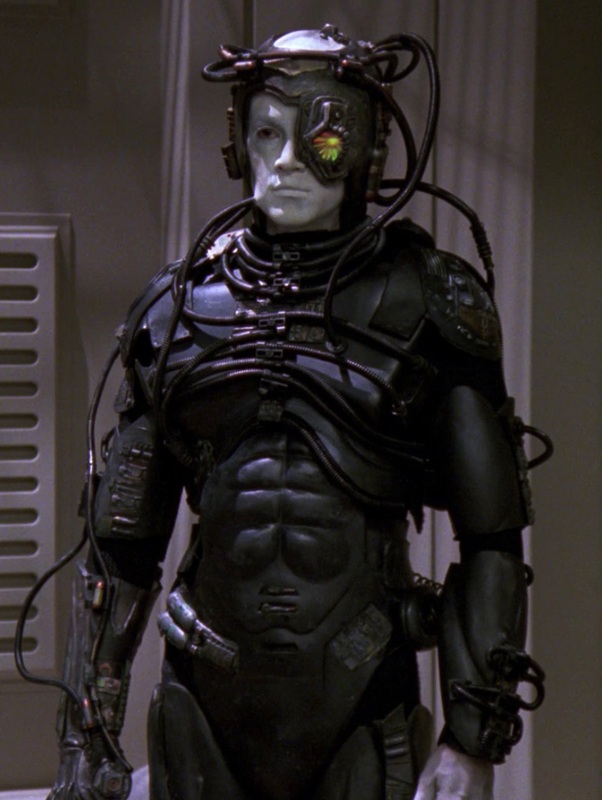 ‘I, Borg’ is Picard’s first encounter with the Borg after his assimilation, after his unwilful destruction of 39 Federation starships at Wolf 359, after the loss of his personhood and absorption into the monolithic entity of the Borg. Naturally, he is testy. Here we see Picard raw (not quite as raw as when he opens fire on assimilated Starfleet officers in First Contact — but raw). When Geordie expresses misgivings concerning their course of action to use the Borg drone as a destructive force in the Borg Collective, Picard compares Hugh to a lab animal and tells Geordie to cut any emotional tie he may have developed with the Borg. Continually he refers to this drone as ‘it’. But Geordie has witnessed something that Picard, who avoids this Borg — designated 3rd of 9 — has not. Geordie has seen the drone move from ‘it’ to ‘him’. He begins as standoffish to the drone as anyone could expect. But through conversation with 3rd of 9, an individual personality begins to creep through — indeed, the Borg drone takes on a name. No longer 3rd of 9, he is Hugh. Guinan forces herself to meet Hugh after a confrontation with Geordie, and she realises that Hugh is no longer simply a Borg drone. He is an actual person. He has come to see Geordie as a friend. And he is capable of learning — of learning that resistance, despite the Borg mantra, is not futile. Guinan is living proof. Hugh proves himself a hypostatic (or personal; hypostasis is Greek for person) entity distinct from the Collective when Picard tricks him into thinking that Locutus is under cover, and commands Hugh to help assimilate the human race. Hugh: I will not help. … Geordie must not be assimilated. 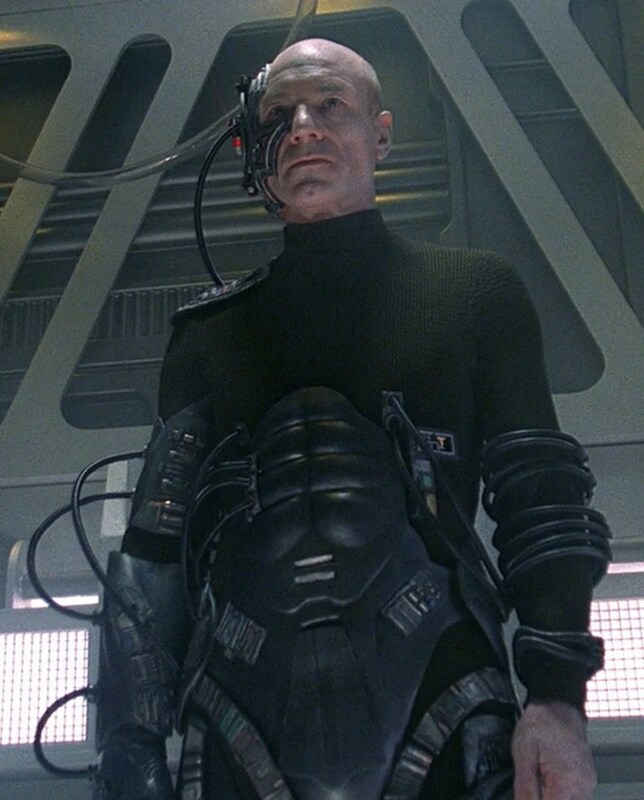 Picard: But you are Borg. Hugh: No. I am Hugh. In this scene, Hugh uses the first-person singular pronoun I for the first time, hitherto having referred even to himself alone and lonely as we. Hugh is a person. He ultimately chooses to return to the Borg Collective because his continued presence would mean danger to the Enterprise, including Geordie in particular. And Hugh, like Spock, believes that the needs of the many outweigh the needs of the few. Or the one. The Enterprise crew like to use the term individual for Hugh’s hypostatic flowering. And it is certainly the most common one in our current culture. Geordie describes his life in purely individual terms, in terms of his own individual freedom and such. The willingness and ability to be alone. This is certainly the most potent aspect of personhood that differentiates humanoids from Borg. But the Borg are not persons, and persons are not merely individuals. The Borg cannot choose for themselves because, while they are wired into the Collective, they have no selves. The Borg is just a gigantic cybernetic-organic collective hive mind operating in monotone and monochrome. Hugh demonstrates that the isolated individual alone is not what truly makes a person. If individualism were truly the supreme mark of personhood, then Hugh’s hypostasisation (that is, becoming a person) would have ended with him seeking asylum on board the USS Enterprise with his friend Geordie. But persons, for all our hypostatic uniqueness, are also inescapably linked to one another. We are in many ways independent. But in many others, we are interdependent. And we demonstrate ourselves as persons most fully when we sacrifice ourselves for each other, surrendering our own selves and selfish desires for the good of other persons. We thrive on each other, and we therefore choose others above ourselves. This is the lesson of true personhood that Hugh teaches us. Not individualism, but sacrifice and its power for good. This is the high cost of becoming a true person. *Do the Borg count as a race or a species or a genos? They are the assimilation of the biological and technological advances of various civilisations. I would wager that they are not, but are instead a blight on the ‘biodiversity’ of the galaxy, instead. **Robert, although his name is pronounced in the French manner, also speaks with an English accent. This entry was posted in Philosophy, Science Fiction and Fantasy, Television and tagged captain picard, geordie la forge, guinan, hugh, hypostasis, i borg, locutus, personhood, science fiction, star trek the next generation, the borg, what makes a person on November 2, 2014 by MJH. These laws were developed in Asimov’s various robot stories and novels as a way of protecting humanity from the Frankenstein complex. The laws are so thoroughly encoded into the positronic brain that an Asimovian robot would cease to function were it to break one of the laws. The thought came to me while watching Elysium that none of the action of the film would have happened with the Three Laws — the robot cop wouldn’t have been able to use force against Matt Damon’s character, who would thence not be irrated, and thus never invade Elysium. Boom. Done. What other films would be affected by the Three Laws of Robotics? Obviously robots built by aliens, such as Gort in The Day the Earth Stood Still, don’t count. Well, straightaway, obviously no Terminator, Matrix, Blade Runner, or Battlestar Galactica or any other film/TV series wherein robots are the antagonists. The Three Laws are meant to prevent precisely those films. Alien would only be slightly different. Ash would have to be replaced by a human who, for some diabolical reasoning or bent in his psychology, was willing to do what Weyland Industries wanted. Similarly, then, for Michael Fassbender’s robot in Prometheus. It is plausible to use a human being in these two cases. Star Wars would lack the interrogation droid, but I’m pretty sure people could have given Princess Leia needles instead. And the droid army in Phantom Menace was utterly useless, anyway; the Trade Federation would have done better to hire mercs or something that can’t be taken down by a power failure. However, the fact that their actions in helping run small fighters kill ‘human’ life, programming R2 units and their ilk with the Three Laws would make them unserviceable in the Rebel fleet. The auto-pilot in Wall-E would not have suppressed the information of Earth’s habitability brought back by EVE and they would have gone straight home. Do mutants count as human? The Sentinals in X-Men: Days of Future Past are designed precisely to hunt down mutants, although they do turn on human sympathisers and potential parents of mutants. I wonder. This entry was posted in Movies, Science Fiction and Fantasy and tagged alien, elysium, isaac asimov, robot movies, robots, science fiction, three laws of robotics on July 21, 2014 by MJH. As with The Metamorphosis (the last book I reviewed here) which was also a recommendation from my brother Michael, I came to The Day of the Triffids expecting something a bit more sensationalist. All I knew was that there were these plants called triffids, and they killed people and possibly tried to take over the world. But, like Kafka, Wyndham isn’t here for the sensationalist, although what he produces is sensational. Good speculative fiction, whether sci-fi, fantasy, or this sort of mild, near-future SF, takes a new and unique concept and moves beyond horror and shock and action and asks — But what would life be like? How would people survive? What are the practicalities of existence in such a situation? Thus the storyteller takes the story beyond entertainment to art. If you will. The premiss of the story is that one night, there was some sort of comet that came near to the earth, casting a meteor shower in brilliant green colours in its wake. The next day, everyone who watched that meteor shower has gone blind. Much of the story is the simple, practical survival realities of what to do in a society filled with the blind. What sort of culture do you develop? What skills are most necessary? What would marriage look like? More immediately — what about food, water, protection from the elements? The entire system has broken down with no one there to care for it, after all. Humans are still the greatest asset on Earth. This is the world into which our sighted hero is cast, having spent some weeks with his eyes bandaged due to a run-in with a triffid. We follow him as he navigates London and southern England in his quest for survival, hope, and preservation of whatever good remains. The triffids are the great complication in everything. They are a genetically-engineered species of plant that produces really great vegetable oil. Unfortunately, they also come with a stinger in their tops, which are like those of a pitcher plant, that can reach quite far. And they can walk. And grow to over 2 m tall. In a world of the blind, there is no defence against such a silent predator. And so they must not only seek out food, water, and shelter, but protection against the triffids whose day has finally come. So many questions of the human condition are raised in this book, so many issues surrounding society and culture, that it is worth reading. This is not sensationalist sci-fi, although it does have its share of action. This is literature even the literati would like. This entry was posted in Books, Literature, Science Fiction and Fantasy and tagged book reviews, day of the triffids, franz kafka, john wyndham, science fiction, sensationalism, speculative fiction on June 24, 2014 by MJH.